The Cabbage Soup Diet is a fast weight loss diet which includes the consumption of cabbage soup in great amounts. Its proponents maintain that it can help you lose up to 10 lbs in 2-3 weeks. Some experts believe that this diet is not healthy and the effects are unsustainable. Therefore, we will review all the advantages and disadvantages of the Cabbage Diet Soup. The diet actually consists of cabbage soup only for seven days. Yet, you can also have one or two other foods, like skim milk, fruit or vegetables each day. Cabbage is a low-calorie food, or minus calories, meaning that you will burn more calories that you actually consume it. The more cabbage soup you consume, the more weight is lost. This diet is to be done before an important event or a longer-term diet regime, so it should not be done more than a week. 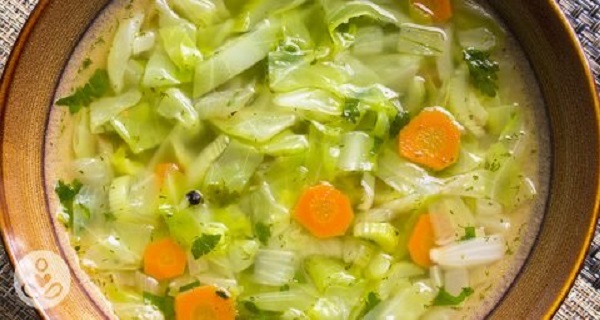 The Cabbage Soup Diet is also known as the Sacred Heart Hospital Diet or the Mayo Clinic Diet, as it is believed to have been developed as a way to quickly lose weight before a surgery. Yet, these claims have been denied by the implicated hospitals, so the origins of the diet are unknown. Yet, it is known that it has gained popularity during the last two decades of the previous century. You should chop all the ingredients into cubes. Then, sauté’ the onions in a bit of oil in a stock pot, and add the other ingredients. Cover with water or vegetable cocktail and you can add bouillon cubes or other seasonings. Boil the mixture and then lower the heat. Simmer for about half an hour, until the ingredients become tender. You can add salt, pepper, herbs, spices, and hot sauce, as well as other non-starchy vegetables, like spinach or green beans. You should consume the soap on a daily basis, as much as you can, several times daily. You can add one or two other low-calorie foods every day. Drink only water, unsweetened tea, or other calorie-free beverages. This diet might limit the intake of nutrients, so make sure you take multivitamins. Day One: Unlimited cabbage soup and fruit, but avoid bananas. Day Two: Only soup and raw or cooked green leafy vegetables. You can have a baked potato with butter or oil, but avoid beans, peas, corn. Day Three: Soup, vegetables, and fruits in unlimited amounts. Day Four: Unlimited amounts of bananas, skim milk, and cabbage soup. Day Five: You can have 10–20 oz (280–567 grams) of beef, up to six fresh tomatoes and unlimited cabbage soup. You should drink at least 6–8 glasses of water. Day Six: Soup, beef, and green leafy vegetables. You can replace the beef with broiled fish. Day Seven: Avoid added sugar, but you can have vegetables, brown rice, unlimited fruit juice, and cabbage soup. You need to wait for 2 weeks after the first one if you want to repeat this diet. When it comes to the effectiveness, we must say that this diet has never been studied before. However, it is a fact that it is low in calories, so it probably leads to weight loss. However, the sad truth is that the lost pounds will probably come back soon after the end of the diet. In the case of low-calories diets, the body lowers the metabolic rate in response, so the body burns fewer calories than it usually does. Yet, the metabolism is slowed down after the third day of a very-low-calorie diet. Due to this, it is often difficult to stop a crash diet. Yet, in the case of obesity, individuals, under the supervision of a doctor, might actually benefit from low-calorie diets, which often last for 4–12 weeks and experience great short-term improvements in weight loss and metabolic health. Yet, newest studies have shown that even fast diets which are low in calories reduce insulin resistance. Another advantage of this diet is that you are not supposed to stay hungry for most of the day. Moreover, you are allowed to eat many fruits and vegetables, which are high in fiber, and low in calories. However, since the foods are limited and repetitive, you sometimes just cannot eat enough to stay full the entire day. This diet is also inexpensive, as it consists of several basic foods and cabbage soup. Yet, apparently, the disadvantages of this diet outweigh the positives, even though it might help you lose weight. First of all, this diet lasts for a week, which is not enough time to lose weight in a healthy way. In the first week of a low-calorie diet, the body is able to lose only 34% of the weight from fat, and the remaining 2/3 are muscle mass and water. The water comes from the glycogen stores, which are the energy reserves of the body, and when stored in the system, glycogen binds to water molecules. When you do not consume sufficient amounts of calories, the body uses the stored glycogen to provide energy and sheds water. Moreover, the kidneys might excrete more water and salt in the urine. Yet, when you start eating normally, the body will again fill the lost emergency stores and water. Additionally, this diet also lacks nutrients, like minerals, vitamins, and protein. The reduced protein amounts will make it difficult to prevent muscle loss, which is necessary to a proper metabolism. Furthermore, this diet is bland by nature, that it, it is difficult to stick with for a week. Numerous people find it tasteless and unappetizing and makes many of them give it up. For some people, it might be a negative thing to have to cook so much in advance in order to have the needed amount of cabbage soup. This diet should not be followed for more than a week, as it lacks nutrients and it is highly restrictive. Diets which are low in nutrients are designed to lack nutrients. This diet is very limited and unbalanced, contains no protein, and is low in calories, fat, and carbs. If you take multivitamins, there are no serious risks. However, if you do not make up the lost nutrients, you might experience weakness, dizziness, and light-headedness. In the case of diabetes, you should be cautious as the low content of carbs and calories might alter the blood sugar levels. If you follow it for a week, however, you probably won’t experience any of these side-effects. Rapid weight loss might lead to the formation of gallstones. When you consume high-fat foods, the gallbladder releases digestive juices to help break them down easily. If you avoid fat, the gallbladder may not empty for some time and this stimulates the formation of stones. The foods included in this diet make it hard to reach 1,000 calories daily, which is below the needed minimum calories for the proper functions of the body, which is 1,200 calories for women and 1,500 calories for men. Very-low-calories diets are only recommended in the case of obesity, and only under the close supervision of a physician. This diet is rich in fiber, so it might cause cramping and flatulence.